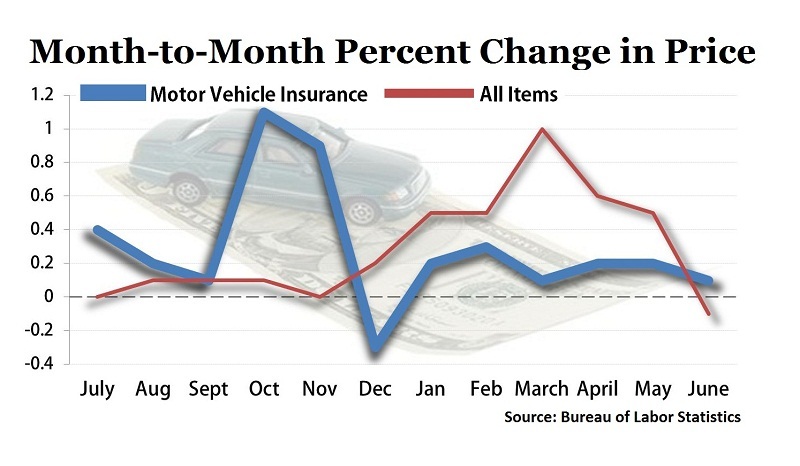 The latest edition of the Bureau of Labor Statistics (BLS) monthly report on price trends shows that the average price of motor vehicle insurance was a mere 0.1 percent higher in June when compared with May. The new Consumer Price Index (CPI) data indicate that June 2011 car insurance policy costs were 3.8 percent higher than in June 2010. The average price for all goods measured in the CPI went in the opposite direction. The data for all goods showed a month-to-month decline of 0.1 percent.